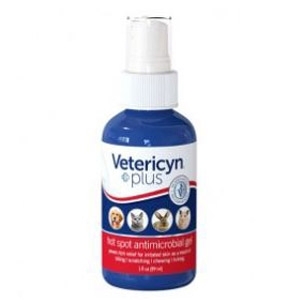 Vetericyn Plus Hot Spot hydrogel is the first line of defense for your companion animals skin needs. Based on advanced hypochlorous technology, Vetericyn Plus Hot Spot hydrogel is formulated at an appropriate pH level, and will not burn or sting. This product is great for abrasions, sores, scratches, itchy skin or reoccurring skin irritations. Great for all animals alike, our Hot Spot Spray aids in keeping the skin healthy and free of irritation. 3 ounces.